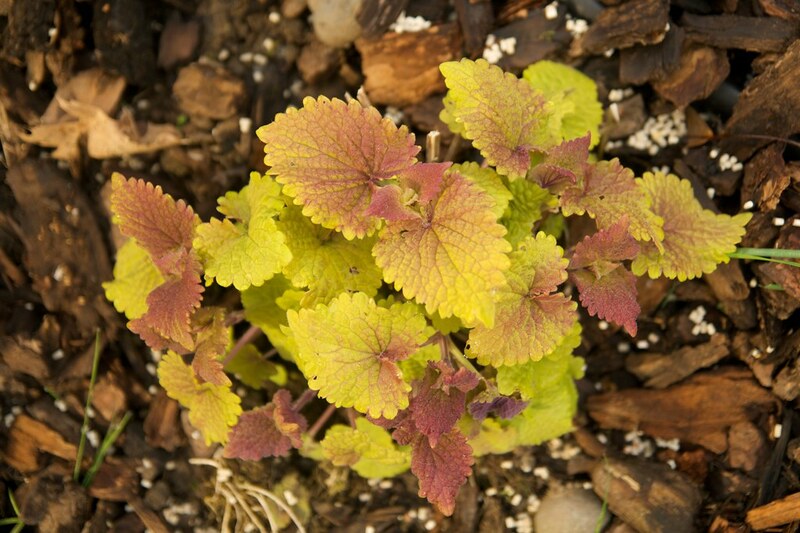 For my next entry in my "Year in the Life" series, I'm going to focus on another of my favorite plants, Agastache 'Golden Jubilee'. Unlike Joe Pye (my first entry in the series), which I've loved for years and years, I was only introduced to 'Golden Jubilee' last year. I had just planted the first part of my garden, and instead of any sort of plan, was running through the nursery grabbing things I'd always wanted in my garden, if I ever got one! Of course there was Joe Pye, Ornamental Grasses, Helenium, Salvia, Geraniums, all the usual suspects. One plant, however, wasn't on my list, but caught my eye anyway. 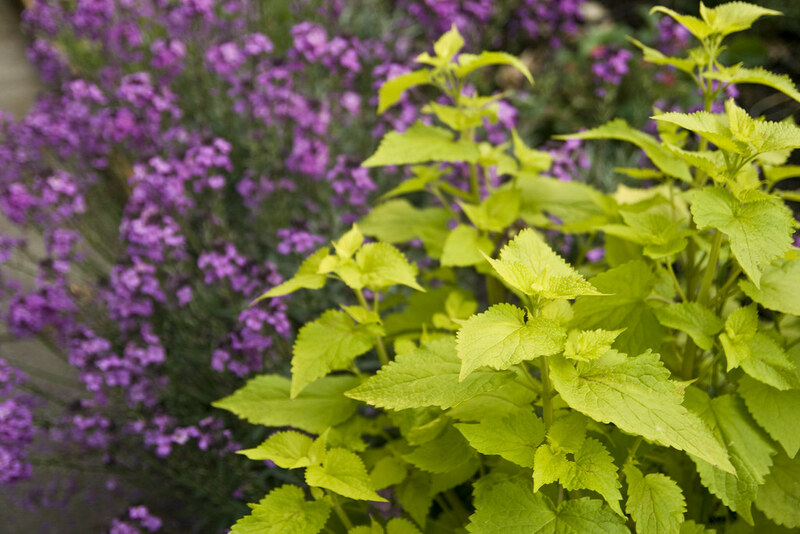 Agastache 'Golden Jubilee', with it's bright yellow foliage and cheery blue-purple wands of flower, immediately grabbed my attention. I love combinations of purple and yellow, and here was one plant that had both in one package. I was smitten. To be honest, 'Golden Jubilee' didn't do much that first year. I deadheaded it right after planting, wanting it to put all it's energy into good roots for next year, so it was pretty unassuming and I kind of forgot about it. That all changed with the following spring when the new shoots emerged from the ground. 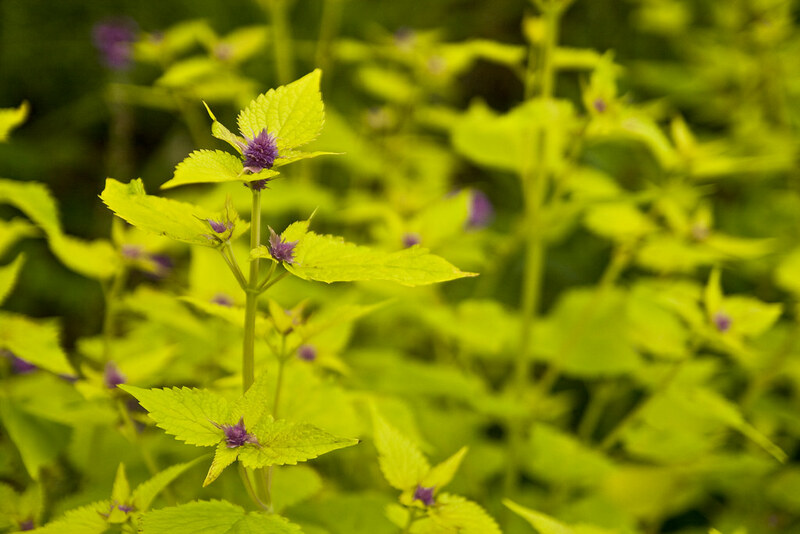 Impossible to miss, they are bright golden-yellow flushed with purple, as beautiful and striking as any coleus. It didn't hurt that they were also one of the first things to emerge in the spring, at a time when all gardeners are desperate for any growing thing! After a few weeks, I realized how wonderful the foliage of the plant really was, and I ran out and bought 2 more plants to site near the original, wanting even more of an impact. 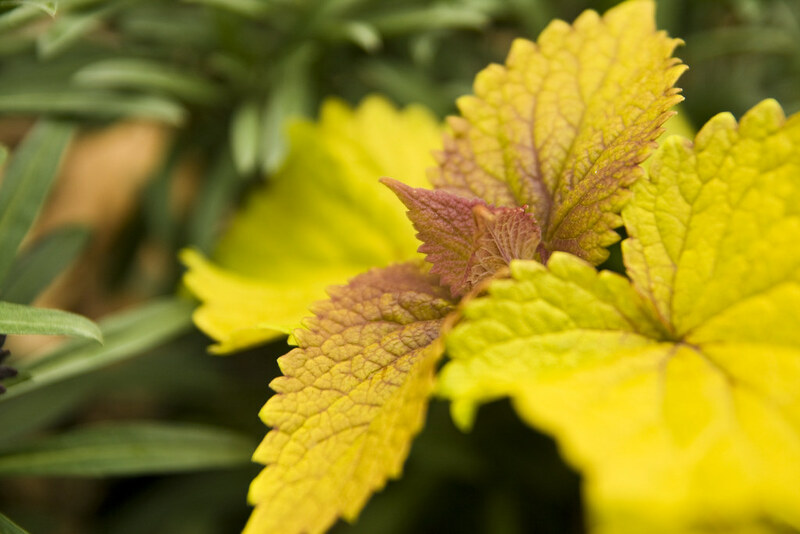 As spring turns to summer, and the plants race upward, their foliage does lose a little of its intensity, fading to a pleasant sort of chartreuse color. Being so early in the spring, the 2 new plants grew at practically the same rate as the original, and if I hadn't know, I would have thought they had all been planted at the same time. They grew rapidly to over 3' tall (much taller than the 2' the labels had indicated), but I was thrilled, as I love tall, robust plants! They harmonized beautifully with the Erysimum 'Bowles Mauve' they grew near, as well as offering a wonderful foliar contrast to the Sedum 'Autumn Joy' and the Pennisetum 'Karley Rose'. The blooms started around the end of June and those first few weeks are the most delicious shade of violet, almost grape-ey, I'd say. As they lengthen, they fade a bit and loose a little bit of their saturated richness. Regardless of their color, the blooms are LOVED by bees, the plant practically swarms with them. I can't tell if the speed with which they faded this year was normal, or if it was the sudden blast of heat in July. We'd had a very cool and rainy spring, which made for lush, fast growth and lots of vibrant blossoms (not having bright sun to bleach them out). Almost overnight, however, the temps went from cloudy and upper 70's to full sun and near 100° temps. 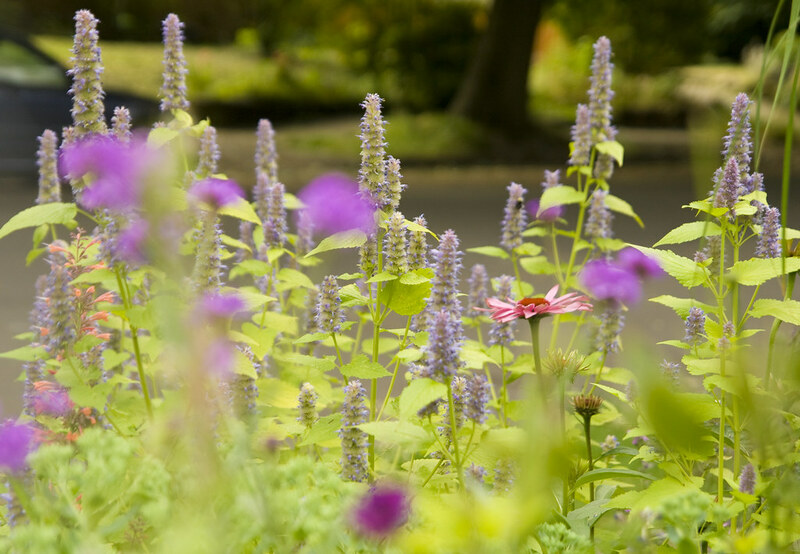 It seemed to bleed the color of the Agastache almost overnight to a dull blue-gray. Even if the blooms weren't as richly colored as before, they were still lovely and continued to lenghten and bloom for a month or so. At this point, I had to decide whether to let them continue, as the shape and form of the blooms was still very striking and a nice addition to the border, or should I cut the spent blooms off in the hopes I'd get another flush of bloom later in the fall. Well, I decided to cut the spent blooms off, but may have waited a bit too long, as when I picked the cut flowers up off the sidewalk, there were literally millions of tiny seeds on the ground! Oh well, perhaps they had already spent too much energy on seed production, perhaps I should have cut back further, either way, they didn't grow much new foliage, nor did they re-bloom. This year, I think I'll cut 2 of the plants back earlier and leave the other, just to see what happens, after all, gardening is partially about experimentation, right! In closing, I think the reason I think of it with such admiration is that it was the plant that introduced me to Agastaches, which are now one of the most numerous plants in my garden.If you are looking for an easy-to-grow plant for full-sun and well-drained soil, Agastache 'Golden Jubilee' is a good bet! Great series of shots. I generally shy away from golden foliage but the chartreuse it takes on later in the summer (as well as the more normal green even later) is nice, and I can certainly appreciate the brighter hotter colours in spring cooling down in summer. 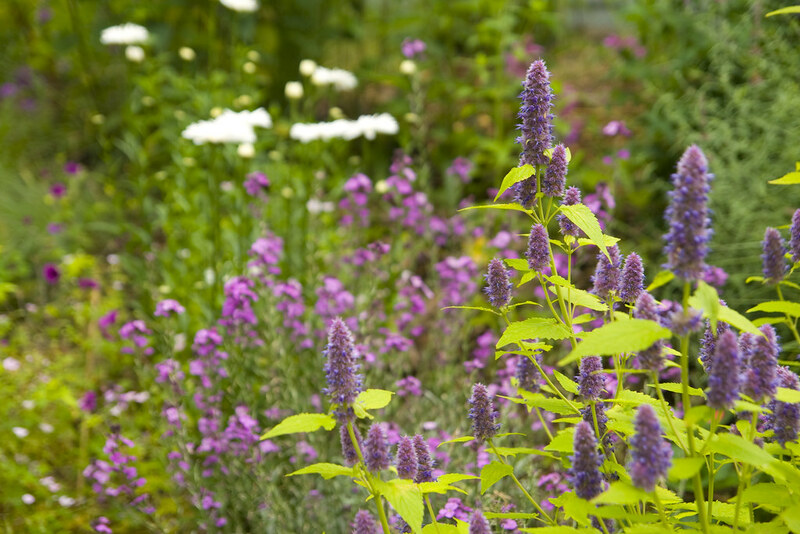 In my experience Agastache may self seed but not to the point of being a pest. Seedlings can be moved easily as well if they aren't in a spot you want it to be in. I had one pop up and I pulled it, then had a change of heart and potted it up. It didn't stop growing and still managed to put on a good show that year despite being unceremoniously yanked out of the ground. The seedlings may not be 'Golden Jubilee' though. I had a 'Black Adder' seed itself and the seedling looked more like 'Blue Fortune'. Great plant! I love how the leaves change from golden to chartreuse. You have lovely plant combinations in your garden. I really appreciate how you have focused in depth on one plant and given us not only a great progression of photographs but also a full discussion of this plant's cultural and ornamental characteristics. I feel like I really know it now (but probably can't grow it with no full sun at Carolyn's Shade Gardens!). Wonderful post. 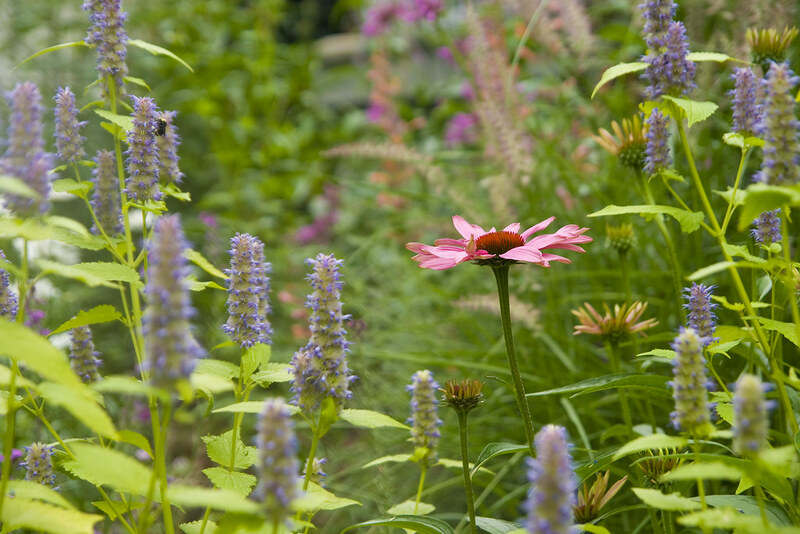 Agastache is not a plant I grow but I will be looking for it this spring.I love it with the coneflower. Great post and very informative. Love the pictures. I've heard of Agastache but not really familiar with it. Now I'm informed and will have to look for some. I have searched for several years to find 'Golden Delicious' Pineapple Sage and was lucky this year. Now I wish I had spent that time trying to locate this plant. It is a must have for the bees. They gather around like our puppies to a peanut butter jar! I've never really heard of or even considered Agastache before, but oh my it's wonderful! I love the combination of the yellowy green with the purple! Scott, I've found this plant easy to start from seed, but it doesn't like my garden! Yours look splendidly happy - the bloom/foliage combo is really nice. Focusing on a single plant in this way is so helpful and entertaining. Thanks for thinking of it. These are simply gorgeous, gorgeous photos of a splendid plant. I was finally able to get my hands on a couple of plants this past spring, and they did brilliantly. I hope they seed and spread and make their golden drifts wherever they want, as the bees seemed to love them. As do I. I'll be back for another visit soon. Great pictures and this is a really interesting plant - I've been looking at seeds since I saw your post and I can definitely make some space for these. I love agastaches and your photos just make me crave summer! Gorgeous. Wow...thanks for all the awesome comments, everyone! Karin: Thanks so much...I do love devising little combinations...now if only I was better at the "big picture"! Carolyn: Thanks, I'm trying to do a little something different to fill these long winter months :-) It would probably be harder to grow in shade, but I've got a few that only get about 4 hours of sun a day and do ok...but definitely aren't as full as the ones that get more sun. Patty: I hope you find some, they are such great plants! RainGardener: I hope you do...trying out new plants is so fun! Liz: Honestly, it's only my 2nd year growing them, but now I'm hooked and am constantly on the lookout for more different kinds. I recommend High Country Gardens for a good variety. Catherine: Me too! 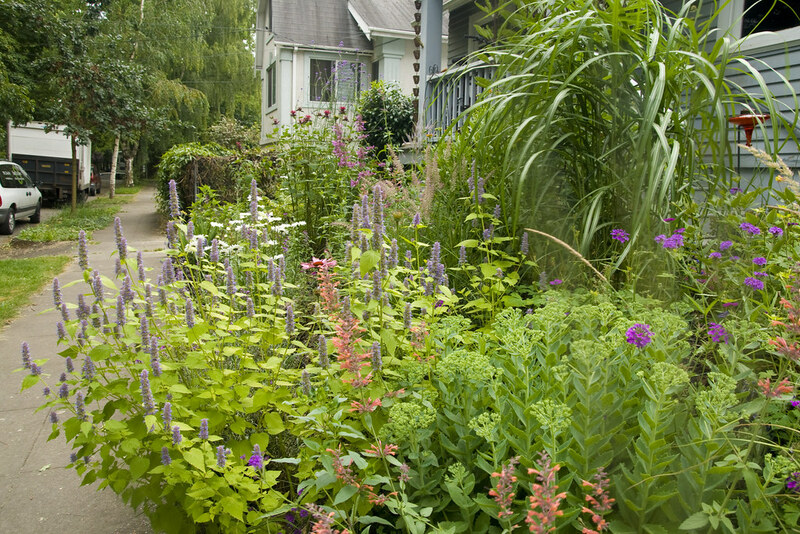 I'm in love with them and while planning out the back yard garden last week I realized it was becoming more of an Agastache garden than anything else...with no less than 4 different varieties! Cyndy: Good to know about the seeds...sorry they don't do well for you...maybe one of the other type...the southwestern Agastaches, would do better for you? Jodi: Thanks...I hope your plants are fruitful and multiply...I'm hoping the same for my garden...I love me some volunteers! A Year: Yay...I hope they do well for you! Grace: Hahaha...I know, me too...it's a little difficult poring over spring and summer photos right now, makes me really itch to get in the garden! I love agastache Jubliee! It is such a pretty plant. We like to put handfuls of it into a jar of water and refrigerate it. Such a refreshing drink it the summer! Beautiful photos! Flowergardengirl: That's a very good point, and I think I'm gonna try that next year...I noticed this summer that the plants that I let go got really faded foliage and didn't really bloom as much...but the seedlings kept their color! Willi: OMG...that's such a great idea! Thanks Scott, I'll bear that in mind if I have any trouble with my first attempts. I'm guessing I'll probably grow more than I possibly have room for so I'll be sending any extra seedlings to my Mum. It's good having parents with garden space isn't it.